The Workout Redefining Self-Awareness: Our Interview with Natalie Kuhn of The Class | Yellow Co.
Have you ever done an intense workout, danced, or ran, and really got your heart beating and welled-up with all kinds of emotions? (Just me…? Okay good.) Tangled up emotions and experiences get stifled and stuck, leaving our bodies hurting and minds racing. In perfect timing, when I realized I needed to literally and figuratively shake things up, I found out about The Class by Taryn Toomey. When I first attended The Class at Wanderlust in Hollywood, Natalie Kuhn was teaching. And when I say teaching, I mean guiding, challenging, and poetry-pouring into everyone in the palo-santo scented space. Don’t even get me started on the music… look up “There Will Be Time” by Mumford & Sons and Baaba Maal, and play from start to finish. Woof. The music in The Class by TT is described as the co-teacher. Yes, you get a great workout, but there’s so many other things that happen during The Class, the most important being to witness it all (thoughts, feelings, discomfort) without judgment. Only someone who has a deep understanding and personal experience of what the head and the heart needs could lead a cathartic class the way Natalie does. Today on the blog, she’s sharing with us the heart behind The Class, how change within actually takes shape, and what it means to let go of the fear of failure. In your best words (since The Class is really something to be experienced rather than explained), what is The Class and how did your role as VP of Programming and Founding Teacher come to be? I have the good fortune of serving as a Founding Teacher and the Vice President of Programming for The Class by Taryn Toomey; a practice of self study through physical conditioning. The reason why it’s hard to describe is that everyone’s journey of self-discovery is so wildly different and completely unique to them. I met Taryn when this Class was just something she did for and with friends in the gym of her apartment building. I remember smiling and laughing most of the way through because it was so physically challenging! But there’s something more than the effect it had on my body that kept me coming back. We decided early on that I would start on a trajectory to become a teacher, even though there was no real plan for it to become a method or a business. It was simply an offering that came from deep in TT’s heart and soul. I helped her produce the first Retreatment and from there, we decided that I would become the first official employee. That was back in 2013. I’m proud to say that 5 years later, we are a family of incredible Teachers and dedicated team members that allow for The Class to be offered in NYC, LA, and Vancouver. Why is it important that we witness our resistance to discomfort? How is The Class a metaphor for daily life? As the old saying goes, “If nothing changes, nothing changes.” And change does not happen while we are sitting on the couch watching Netflix. Change occurs at the frontier of who we believe ourselves to be and who we have yet to become. The Class uses the body as the container for witnessing ourselves on that very uncomfortable threshold. What workouts/practices for the mind and body would you suggest to those who cannot attend The Class because of geographical or financial reasons? The Class is the practice of awareness, the ability to witness your thoughts rather than believing you are them. Meditation is the non-doing practice of awareness. I would say that for anyone seeking to start on the path of awareness and attention, a meditation practice is the place to start. I want to write down everything you say when teaching! Where do you glean inspiration, understanding, and knowledge that leads to the poetic encouragement and challenging questions you ask during The Class? Oh my goodness, thank you! I am always listening to podcasts, reading books, and discussing self-improvement with friends and family. My main teacher right now, though I have never met him, is David Whyte. I am making my way through his canon of poetry. My classes are a result of my own self-contemplation inspired by the poetry of Master Whyte. Some have described going to The Class as a form of therapy. Is there a place, ritual, or activity that is a form of therapy for you? Without a doubt, my medicine is a dinner party with my closest girlfriends. Oven on. Phones off. I am a self-professed workaholic. I love what I do and could keep going weeks on end without a real day off. These days my work schedule lets in free nights and weekends. The company has been so supportive in holding me accountable. Now, when I have personal plans, my calendar says “PROTECT” and everyone helps me do just that - protect that sacred time. Any advice for women who want to create meaningful work but are held back by insecurity and doubt? So many of us don’t take that next courageous step because of the possibility of failure. But what IS failure? It is when we set expectations at a time when we didn’t have all the information and then something - else - happens. Some imaginary golden orb known as success is not achieved because something - else - happened. That’s it. So what if we allowed ourselves to take a step without attaching to it what the terrain will feel like when our feet hit the ground? Simplified: if the insecurity holding you back is the possibility of failure, consider the fact that failure is just a fictional way of telling yourself that something other than what you expected happened - and that might not be a bad thing. You’ve mentioned your highest calling in life is to serve others. How has working with The Class given you the ability to merge who you are with the work that you do? Both of my parents are of service - my mom was a nun and later a high school teacher, and my father is the most competent and generous doctor. Helping others feel alive is in my lineage. The work of The Class does just this. Whether it’s people who are looking for a strong workout, or going through a life transition, or on a spiritual path, or teenagers trying to navigate adolescence, or inmates at a juvenile detention center, I have seen this work work. It meets you where you are, helps you define your roadblocks and creates long lasting change. The Class has never felt like a job, it is my vocation. 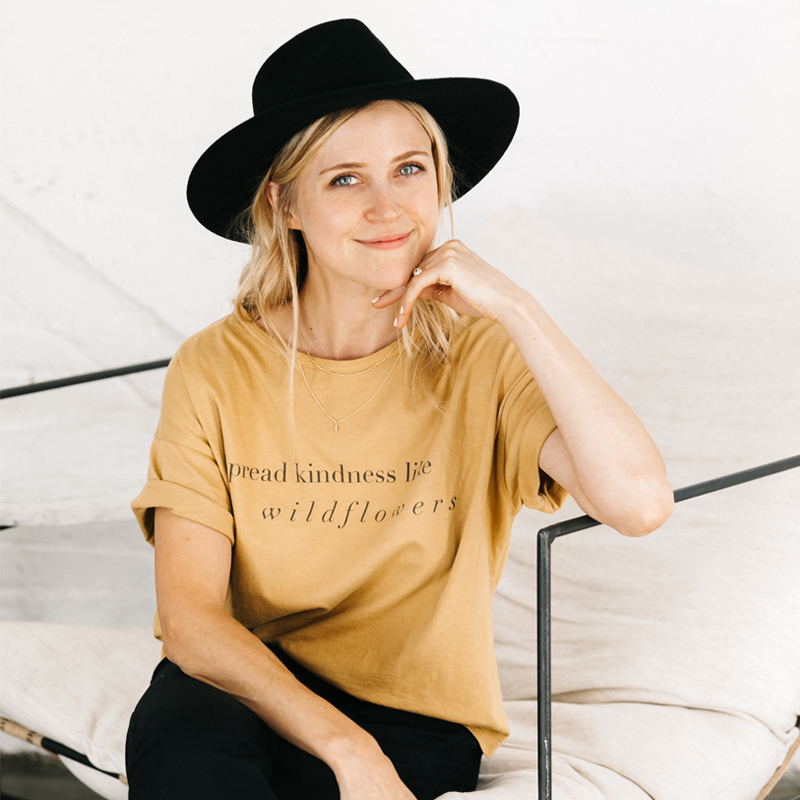 Director of Partnerships at Yellow Co.
As Director of Partnerships for Yellow Co., Kathryn loves learning about and supporting brands, people and organizations that are doing good in the world. Previous writing includes Thoughtfully Magazine, Brit + Co, and HelloGiggles. You can connect with her on Instagram @kathryn_parrish.